On its shiny, space-ship surface, War of the Worlds ushers in an apocalypse the likes of which played out in reality during the poison gas filled trenches of the Somme, and the dawning of the nuclear age. In many ways, it’s a sadly accurate prediction of our dystopian past. But underneath the sci-fi saga that started it all, lies an exposition of earth itself. While humanity is helpless, earth itself fights back against the Martian invaders, thus reinforcing not only our species’ inferior place in the cosmos, but at home on our own planet. This notion of dystopia was never made clearer than the eve of October 30th, 1938 – the night the world ended. 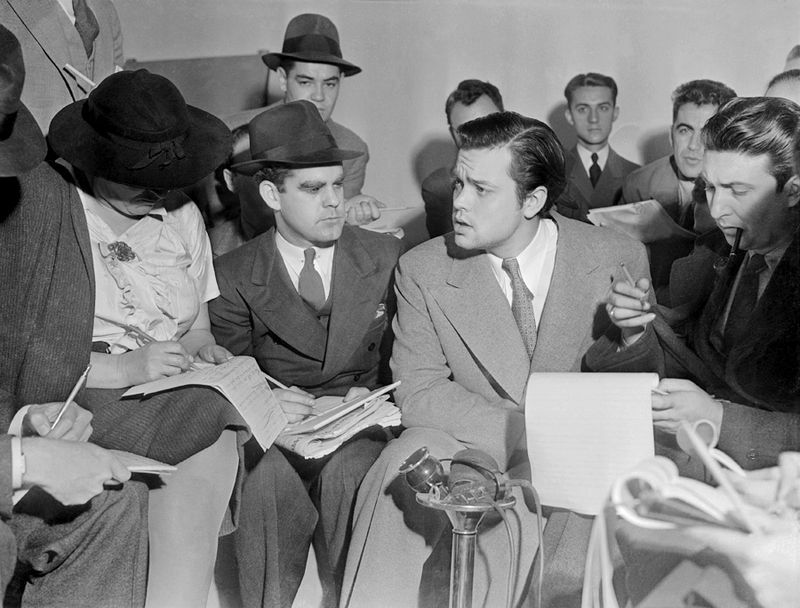 Orson Welles explaining to journalists that there was never any intent to make people think that an invasion was real. And indeed it was a well-crafted, mischievous prank. Combining Welles’ flair for showmanship with Wells’ dystopian, dark, science-fiction made for a radio adaptation that by today’s standards, would only be in compared to ‘found footage’ films. But movies like The Blair Witch Project, a film itself which caused a culture change and paradigm-shifting studio shake-up, can’t hold a candle to this radio production. But how did Welles convince his audience that an alien invasion was real? After all, anyone listening would have heard the CBS introduction to Mercury Theater, and its rather slowly paced prologue which set the scene for the hour ahead. The ratings battle between TV networks, NBC and CBS, existed long before Jack Benny jumped from our ears to our eyes on the small screen. At the time of the broadcast, NBC had the lion share of the audience with the Chase and Sanborn Hour, a variety show featuring a wide-range of performers, including wooden dummy, Charlie McCarthy and his Jeff-Dunham-before-there-was-Jeff-Dunham-puppeteer, Edgar Bergen. The show dominated Sunday night ratings. Indeed, hardly anyone listened to Mercury Theater. It was the modern equivalent of the SyFy channel after Farscape and MST3K left the air. But, that was all before Orson Welles gave CBS got a shot in the advertising arm, and America listened, glued to their radios. As America pinned its ears dutifully to the first 2 minutes and 32 seconds of the NBC Chase and Sanborn Hour, CBS and Orson Welles were busy going through the normal introductions of the Mercury Theater broadcast, introducing its episode, and muddying through a fairly dry 2-minute prologue. And then the fun happened. Over at NBC, after their introductions and a short bit by America’s Funniest Wooden Comedian, a less than well-received singer, Nelson Eddie, crooned on, at his usual time during the variety hour—and that is when the radios clicked. “Let’s see what’s on the other channel,” the collective cry went out. And, because there were no giant remote control clickers for radios, that is when the 9-year-old-of-the-family had to get up and go change the radio station for dear mum and dad. And there it stayed. Because, exactly 2 minutes and 32 seconds into the Mercury Theater Broadcast, the introduction and prologue had stopped—and a ‘newscast’ began reporting strange sightings from Mars, and later, strange, unearthly, activity in New Jersey. What followed was an almost 30 minute unbroken ‘transcription’ of eyewitness events, reports from military officials, and even an address by a voice that sounded remarkably similar to then-President FDR. Mischievous—and well-planned indeed. If you have never heard the radio broadcast in its entirety, do yourself a favor and listen to it. It can be found here https://archive.org/details/OrsonWellesMrBruns . A picture was taken by ZeWrestler at the landing site Grover's Mill, New Jersey. The landing site is marked by the monument in the picture at the current-day Van Nest Park in West Windsor Township, New Jersey. whole thing was a prank, and reassured audiences that there was indeed, no alien invasion. While historians will debate to what level of public panic was indeed caused by a relatively obscure broadcast, there a case to be made for some over-reaction. Nevertheless, it took some convincing from those in the media to calm the collective nerves of the country. Certainly however, afterward, people wouldn’t admit to having been duped, so life went on and CBS accepted the mania surrounding the broadcast as part of its excellence in broadcast history. However, for nearly 30 minutes, it was the night that the world ended. The mischievous mind of Brent A Harris can be followed on Twitter here.